Deutsche Post DHL Group and Ford presented the first of their jointly produced electric delivery vans – or e-van – today in Cologne, Germany. The vehicle, called the StreetScooter WORK XL, is based on a Ford Transit chassis fitted with a battery-electric drivetrain and a body designed and built to Deutsche Post DHL specifications. In 2017, around 150 early build e-vans will be manufactured in the StreetScooter plant in Aachen, Germany. Deutsche Post DHL will use the e-vans to support its urban parcel delivery service in Germany. Deutsche Post DHL, StreetScooter and Ford plan to build 2,500 e-vans by the end of 2018. Like StreetScooter’s existing electric models – the WORK and WORK L – the WORK XL could be also sold to third-party customers. Each WORK XL could save around five tonnes of CO2 and 1,900 litres of diesel fuel each year. With 2,500 vehicles in service as planned, this could result in a total saving of 12,500 tonnes of CO2 and 4.75 million litres of fuel every year. The WORK XL will have a load volume of 20 cubic metres and provide stowage space for more than 200 parcels. The e-van is fitted with a modular battery system delivering 30 kWh to 90 kWh of power, giving it a range of between 80 km and 200 km. The WORK XL not only is different in size and range from its sister vans – the WORK (4 cubic metres load volume) and the WORK L (8 cubic metres load volume) – but differs also in terms of the body construction. The WORK XL’s load area is fitted with shelves and is accessible from the driver’s cab. The vehicle can be loaded via the tailgate and a kerb-side sliding door. With a charging capacity of up to 22 kW, the average charging time is three hours. 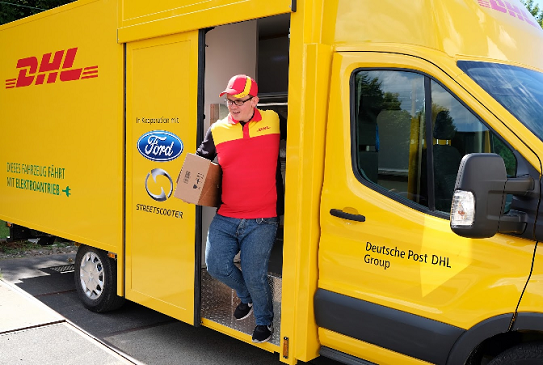 In addition to the new WORK XL model, more than 3,000 StreetScooter WORK and WORK L electric vehicles, plus about 10,500 pedelecs, are currently in service with Deutsche Post DHL, making the group the largest e-fleet operator in Germany.